A dock is utilised for the quick and efficient loading/unloading of product to and from trailer or container units. ICA solutions extend to a complete turnkey product or can simply complement your current dock loading and unloading operations. See the gallery here. Can be configured with skate and roller arrangements for handling requirements. Generally comprises a pair of twin chain conveyors, but can be modified depending on requirements. Generally associated with a fixed trailer registration ramp. Associated with product that requires additional support and is orientated to suit the use of rollers. Can be configured to work with chain arrangements for loading/unloading requirements (drag chain and roller arrangement). 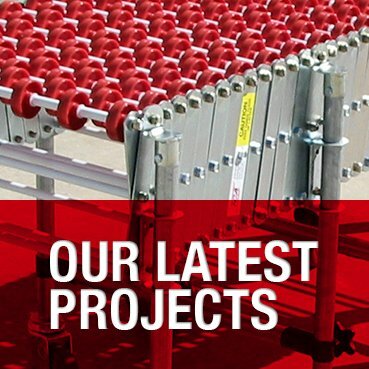 Can work with both roller floor trailer systems as well as chain floor trailer systems, depending on the product. Roller size and pitch is dependent on load requirements. Generally associate with a hydraulically activated levelling unit. Employed in conjunction with skate systems within the paper industry. Generally associated with a hydraulically activated levelling unit. Slats allow for the increased support of product for conveying product to other equipment.